It’s a basic expectation really. You want to walk into a meeting room, easily connect your laptop, and make a presentation. And you can. Your conference room or huddle room system can be a simple plug-and-present; a wireless solution or one that is controlled by your smartphone. But, like all good designs, great outcomes depend on great input. While any of those solutions may be an effective presentation system, if it doesn’t suit the needs of the user, it will fall short of expectation. An effective presentation system is not as much about the technology as it is the user experience. A few simple questions will uncover the right solution for you and your team. Who will be using the system? Will it be a defined group or will the room be open to visitors or personnel from other offices? What are your company’s workflows? 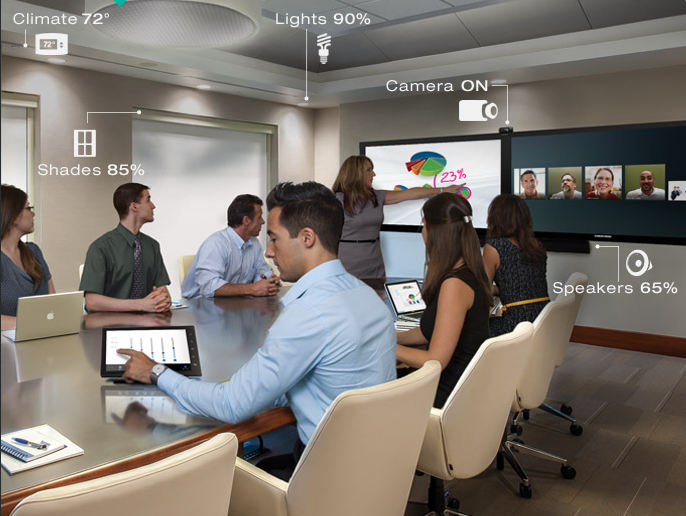 Are you wanting teleconferencing, video conferencing, content sharing, whiteboarding? Is there a company standard such as Skype for Business? What is the desired interface? Minimal interaction, single-button press or plug-n-play? Do you want to avoid the use of small, uninstalled units such as a hand-held remote control that may disappear in a huddle room? Will users be mobile – on smart phones or tablets? And how many connections are anticipated? Do you want the system to detect user mobile phones, syncing the system based on the room’s scheduled calendar event? Are you wanting to create a standardized solution that will be replicated across the enterprise? In this era of rapidly evolving technologies, new acronyms and terminologies abound. VC, VTC, VMR and UC, for example, can mean a variety of things depending on who you’re talking to. One person’s definition of video conferencing may mean a traditional conference room setting with dual-screen monitors and sophisticated cameras that track movement, displaying far side participants as well as shared content. Another may be imagining a video call in the cloud with a completely remote or mobile staff. Collaboration is another term that requires a clear definition. To some it means simple screen sharing via Webex or Go-to-Meeting while others imagine a fully interactive experience that allows wireless sharing of multiple PCs or collaborative whiteboarding. Wireless presentations from a laptop, tablet or mobile phone (Bring Your Own Device) can offer seamless, convenient connectivity to the shared display, but not all IT departments allow this accessibility due to network security. Several solutions on the market today offer point-to-point connectivity, enabling connectivity via a self-contained Wi-Fi without being on your network. Some companies require heightened security measures, restricting wireless and providing only a secure wired solution. Your communications, conferencing and presentation systems are a strategy, not a trend. Be sure your system is based on your needs and desired outcomes and not the latest solution offering by a particular manufacturer. It should take into account your potential for future needs and growth and provide the required scalability. As you add spaces and staff, standardizing on a solution that can be replicated throughout the building or across the campus is a clear cost advantage. Not only will it save in design and installation costs, but users will be more likely to adopt and use the technology in the room if they are already familiar with it. Savings are also realized on employee training. Scalability needs to support technology needs as well. A well thought out strategy and design will provide IT infrastructure to support growth over the next 5 years or more. Network and data requirements, multiple VLANs and robust Wi-Fi can be implemented now, along with conduit and pre-wire for future expansion. The solution drives the best possible outcome. Partner with an AV/IT professional to create huddle spaces, meeting rooms and board rooms that are efficient, effective and impactful, for your users and for your bottom line.